For some time, I’ve been searching for a purely Arkansas-based item of cuisine, something that’s really our own that we can brag about. And while this state does boast itself as the home of the cheese-filled hot dog, rice served with sugar, Grapette and the fried pickle, there has been nothing that truly unites the masses. That is until last year, when documentarian Nick Rogers came out with In Queso Fever: A Movie About Cheese Dip. Rogers did extensive research and discovered the origins of cheese dip dated back to the mid-1930s, when a Mexican immigrant by the name of Blackie Donnelly started serving up the dish at a Hot Springs restaurant. His wife apparently came up with the first recipe. 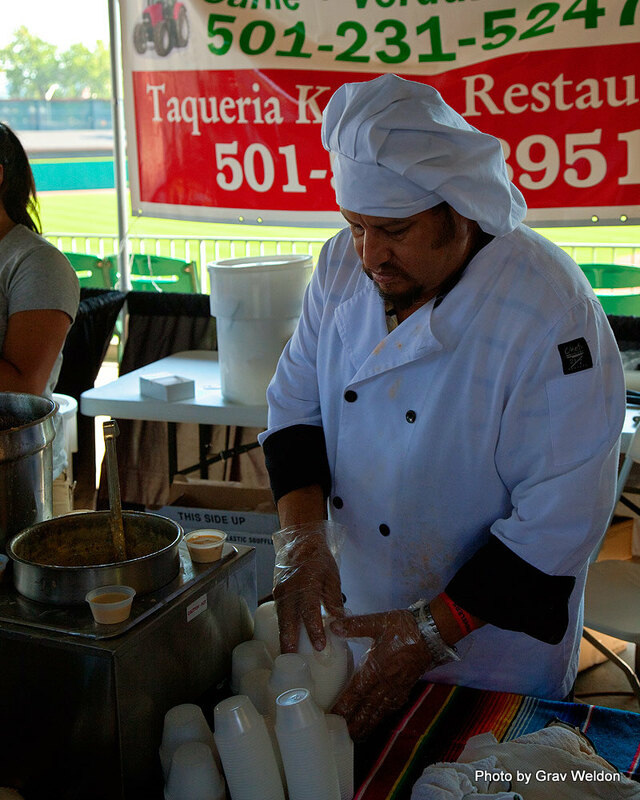 Donnelly moved his business to Prothro Junction (northeast of Little Rock) in 1939, and Mexico Chiquito was born. After the documentary came out, Rogers expected some strong opposition from Texans, who claimed just about every Americanized Mexican dish. But there was silence. His discovery that dated cheese dip to a time before nachos (which were created in the 1940s in Mexico) seems definitive and strong. And that’s where the idea of the World Championship Cheese Dip Competition came from. 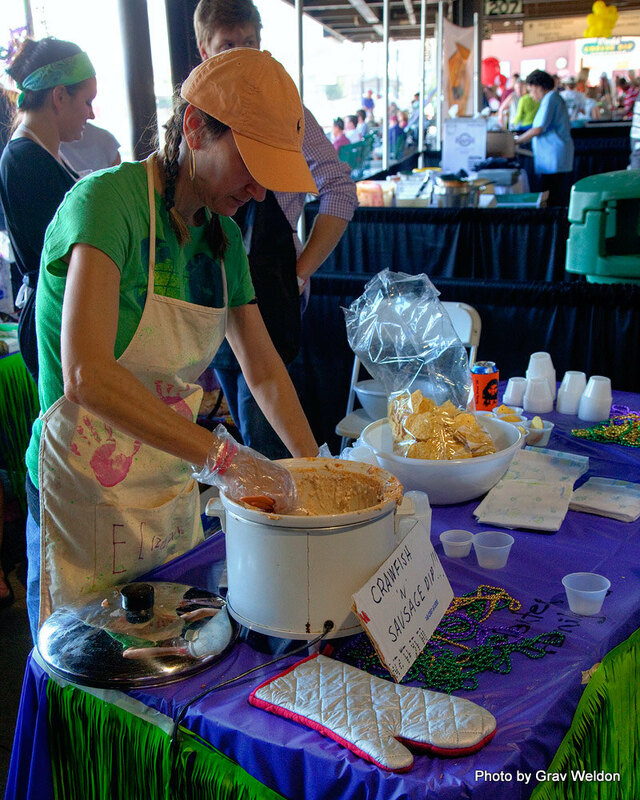 After all, nearby Memphis has its famed barbecue championship; Terlingua, TX has the Chili Appreciation Society International World Chili Championships. Rogers postulated that there might be an interest in having a competition each year to see who does cheese dip right. His timing was great -- Velveeta and Rotel were already planning to team up with a nationwide push celebrating its own famed cheese dip recipe, and having an event to tie that push down with was key. Having someone who actually figured out where cheese dip comes from -- that was perfect. Rogers and organizer John McClure got together and started planning. They got a site, they got teams to compete on the amateur and professional level, and they got a little promotion. What they weren’t expecting was the turnout. The original event was scheduled to run from noon until nine this Saturday, October 9th. 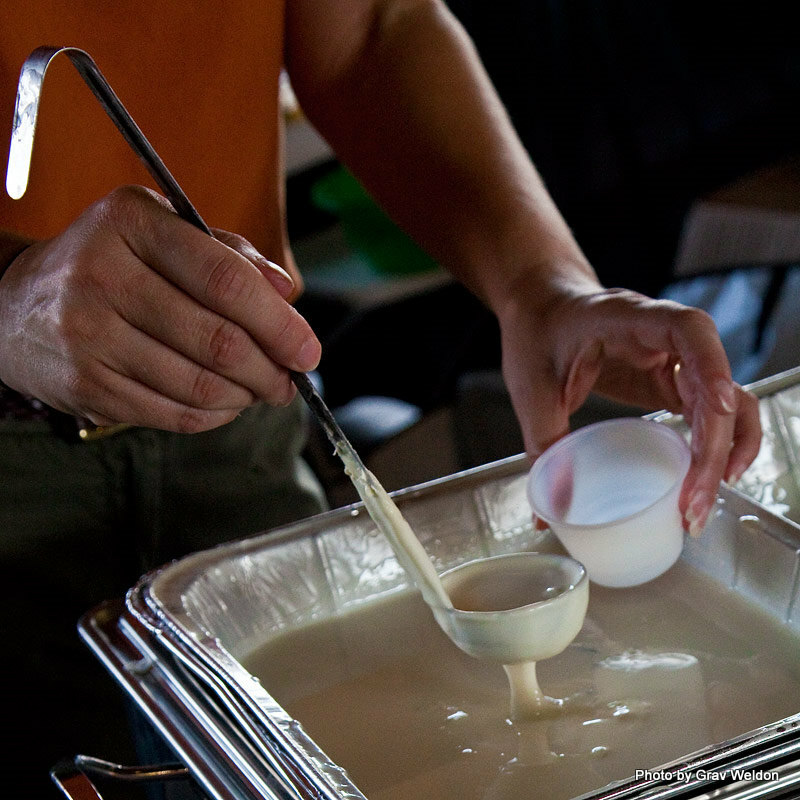 Each amateur competitor was asked to bring five gallons of cheese dip for sampling. The professionals brought more. 250 cases of tortilla chips had been donated and all the booths were set up and waiting. And at noon, a crush of people who paid a $5 or $10 admission fee (the latter received membership into the newly formed Southern Cheese Dip Academy) poured through the gates at Dickey Stephens Ball Park in North Little Rock. When I say crush, I mean an overwhelming throng of hungry cheese lovers who were curious to sample the round of cheesy goodness. 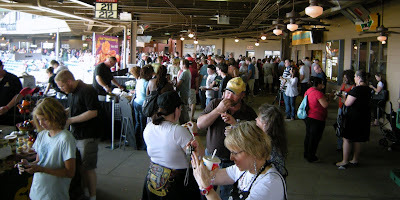 They came in waves, one after another, packing the concourse at the ballpark and standing in line for samples at each stand. Some of the more generous amateurs ran out of cheese dip in the first hour. And by 1:30 p.m. all the donated chips were gone. But the organizers sent out for 30 more cases, and the chips kept coming. 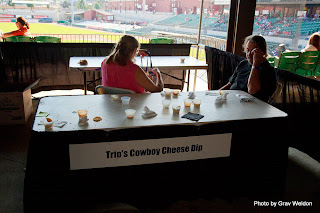 A couple of the professional contenders also sent out for more dip, so those who came between two and four still had a lot of cheese dip to consume, just not in the variety offered earlier. The lines, though… where perhaps a thousand people had been expected, there were three and four times more. When I left out from the event after the winners were announced, the numbers still had not been crunched, and it may be Monday before we know exactly how many people came through. 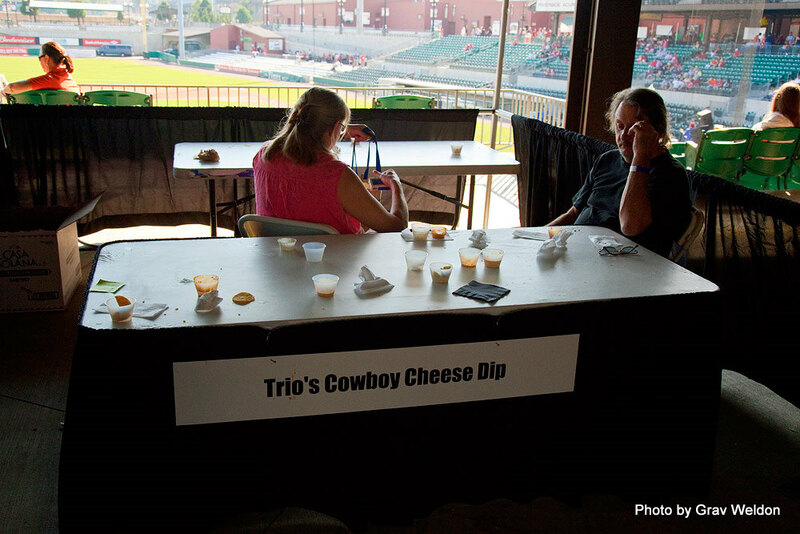 What sort of cheese dips did attendees consume? 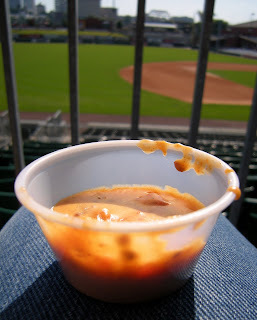 Of course there were Velveeta varieties, such as Patricia Miles’ “Killer” dip which included Philadelphia cream cheese, lots of paprika and beans. The Merry Monks did a vegan version based on tofu that was so good you couldn’t tell there was no dairy involved. Ferneau’s innovative blackened crawfish and green chili version was a revelation of fine flavors that I had to go back for twice. Jim Roberts’ team came up with a spinach queso that was smooth and well balanced. There were also some on the extreme. 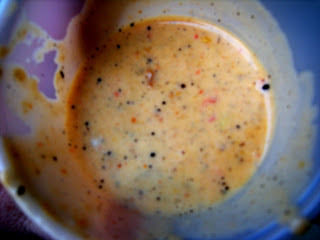 Lindsey’s did a crawfish and andoille dip that was incredibly thick, almost chip-breakingly so. Taqueria Karina’s entry was a two-stepper of white queso topped with a thin pepper sauce that rendered it truly sinus-clearing. And Dizzy’s Gypsy Bistro’s two-stepper combined a rich but fluid cheese base topped with a sweet and complimentary salsa. In the end, the event was called on account of overwhelming attendance. The awards were announced around six, and the gate stopped charging admission. On the final pass through close to seven, there was still a crowd hanging out listening to music after watching the Razorbacks on the big screen. Will there be a second event? Indeed. Next year Rogers & company believe they’ll be better prepared. I think the key will be picking up a chip sponsor, too. Call this a trial run that went wild. 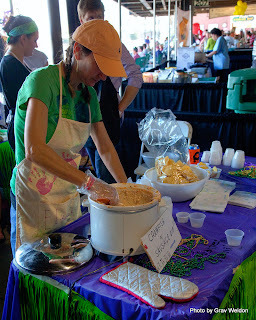 Big Dipper professional -- will represent Arkansas at the Road Food Festival in New Orleans: Dizzy’s Gypsy Bistro. thanks for sharing your trip. this sounds like a great contest. look forward to your report on next year's event! 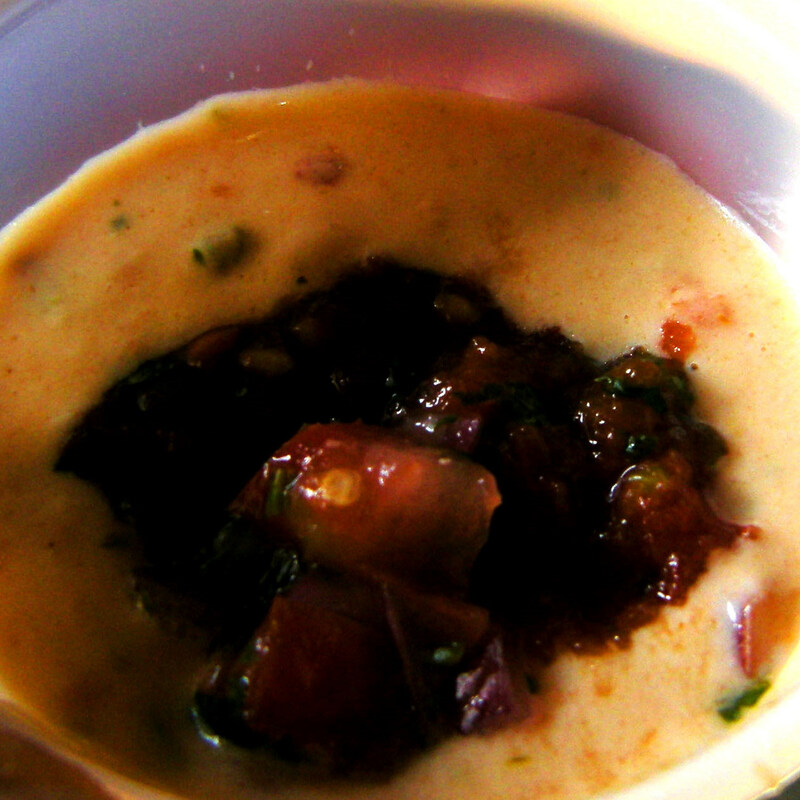 I am the biggest Cheese Dip lover of them all, but was perhaps the most disappointed after visiting the event. How did I walk in and there were NO chips to be found?? At the Cheese Dip Championship?? I was shocked and ended up leaving after only 10 minutes. I know that my $5 went to a good cause, but I hope that next year, the Chip Problem is something that can be fixed. Great information in this post and I think this is resort.